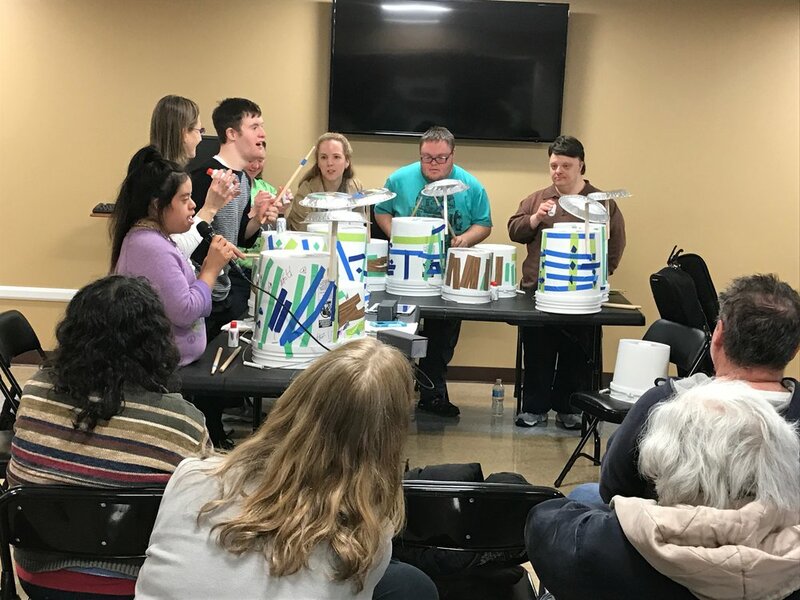 Park Ridge Civic Orchestra's third musical program with Advocate Lutheran General’s Adult Down Syndrome Center participants was a thrill for everyone! At the final class of the winter 2016-17 session on March 13th, family members applauded the enthusiastic drum corps as they kept the beat to songs from Justin Bieber's "Baby" to Johnny Cash's "I Walk the Line." PRCOrchestra musician Lisa Taylor and music therapist Nancy Swanson have taught three of these successful music programs at the Adult Down Syndrome Center in Park Ridge. Each five-class program includes visual arts as well as music to provide a well-rounded experience. "Each student decorated his or her own 'drum,' and you can see how, using the same limited array of colored tapes, they created a great variety of personal designs," says Nancy Swanson." When they chose songs and performed the percussion parts, they expressed their personal creativity and style yet again. "Drum circles like this are used in preschools, prisons, senior living centers and more, because they tap into our desire to contribute to our tribe," says Lisa Taylor." Everyone's life is enriched by making some music with other human beings, and thanks to help from Park Ridge Community Fund and kind individuals, the Park Ridge Civic Orchestra has been able to do that with these very special people." Donations for upcoming music programs at the Adult Down Syndrome Center are encouraged at www.parkridgecivicorchestra.org/support-us.